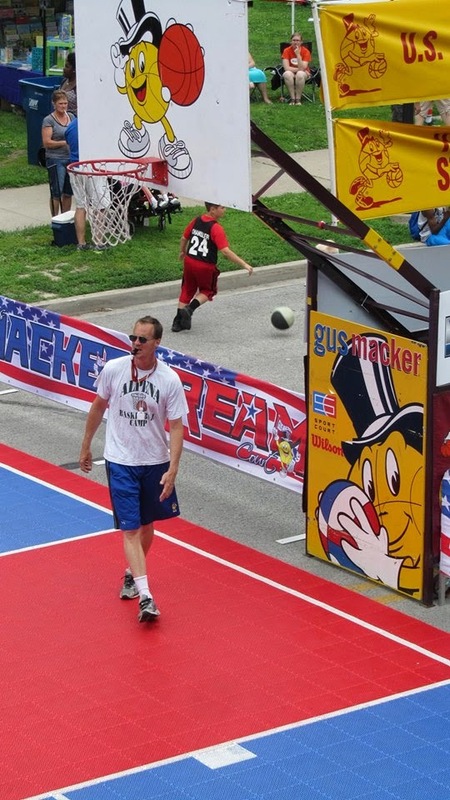 I DREAD GOING downtown after Gus Macker leaves. There's so much energy and craziness for three days, then it's gone. It makes you feel ... melancholy. Yup. That is an Alpena Basketball Camp shirt! We had a great Saturday and Sunday in the store, and I loved walking all of 30 feet to the Dream Court, where I officiated. Yes, I made it to the 8 a.m. game Sunday after going to bed only a few hours earlier. Thank you, Cheeseburgers! We had a great gig at One Restaurant Saturday night, more fun than you should be allowed to have. We'll sleep when we are dead, right, Frank Haxel? Dream Court is where we take young kids from their regular court and put them on the synthetic surface. We have starting lineups, a big human tunnel and announcers. Gus himself (Scott McNeal) did play by play Saturday and I blew a couple of calls because I was laughing so hard and the whistle was nowhere near my mouth. Big Zach of the national staff was also very good doing play by play, and thanks to David Adam and Bill Shuler for calling a couple of games, too. On the Dream Court, parents mostly behave and the kids get so wrapped up in the spectacle that they rarely have issues. If they do, they deal with me, and as tired as I was Sunday, that meant the law got laid down and the whistle was blown loudly. And guess what? No major problems and great fun all day, both days. Sheryl came up with the ingenious idea of charging $2 for using our Second String Music bathroom. There are plenty of portable toilets and a big Washington Park facility, but believe it or not, we had about a dozen people use our bathrooms. We spruced it up and kept it clean, and as opposed to last year, where we got tired of making people mad by telling them they couldn't use it, we had no issues. Turning a negative into a positive. Sheryl has never been in a better mood after a weekend event. We sold a lot of water and soda and a bunch of music gear. We will be remembering this idea for other big weekend gatherings in Washington Park. We are closed today to honor and observe Memorial Day. Sleep, hacking the massive weeds in my backyard and doing nothing are on the agenda. And we will be anxiously awaiting Mackerville again next year. Coach Douglas - guitar player!